Kozack has had it with his favorite team. I was disturbed by the player protests which began with Kaepernick and his parroting of the false BLM narrative. But I could tolerate it as long as it was isolated players. But now, suddenly, it has become the official team position of the Packers. We are a bitterly divided nation. Sports was one of the very few refuges from that. Come game day, it was about the sport and the teams. But now, politics has been injected onto the field at every game, and apparently, the NFL’s official position is to not only allow but encourage this Social Justice Warrior behavior. The original protests were based on a lie, that large numbers of black men were being shot down by police. A quick look at the facts makes that claim ludicrous. The greatest threat to black men is being shot by other black men. Ignoring that and concentrating on the handful of police shootings is like ignoring your lung cancer and focusing on your acne. Now, the protests have changed into some amorphous “unity against injustice and oppression,” when in fact they are just a temper tantrum because the President called the players on their protests, forcing them to claim they weren’t disrespecting the symbols of our nation — the flag and anthem — a patent lie considering the statements made by multiple players. Watching Kaepernick wear his “pig socks” and his “Che” shirt was greatly offensive to me as a Ukrainian whose family had to flee Communism, and a veteran of the Cold War. I don’t care what the players believe or do off the field. But I refuse to be lectured about how unjust and oppressive the United States is while trying to watch a football game. Now, after your meetings, the official position of the league is to inject itself in politics and use the NFL brand and platform for “reform.” If I want a lecture, I can go to a Hollywood movie, watch any TV program, listen to any one of hundreds of “comedians,” or read the New York Times or Time Magazine. I don’t need the aggravation of watching the entire Packers organization, or any other NFL team, essentially give the finger to fans like myself and about half the nation. I’ve got better things to do with my life. So, I’ve taken down my Packer memorabilia. I’ve removed the stickers and plate holders from my car. I’ve cancelled Sunday Ticket, DirecTV, Sirius radio, and won’t be renewing my Game Pass. 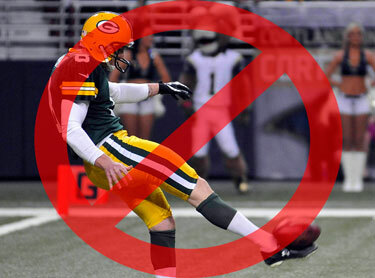 No more trips to Lambeau, or any other NFL venue. The collateral damage now includes hotels, airlines, bars, and restaurants. I’ll be several thousand dollars a year richer. The NFL will be that much poorer. If the Green Bay Packers and the NFL come back to their senses, and get back to football, and stop with the politics and virtue signaling, I’ll be back. If not, then good bye and good riddance. 5 Feedbacks on "Letter to the Packers & the NFL"
IMHO this is a classic case of smart people making a disastrous choice because they don’t have the moral courage to oppose the popular social belief of the moment. The accusation of “racism” today is like the accusation of being a “witch in the late 1600’s or the accusation of heresy in the middle ages. I understand why Goodell and Murphy prefer to not touch this “tar baby” with a ten foot pole. As for the divisiveness in America today; every time the Democrats/radical left needs to regain or expand power they divide. This is what they do just as the MSM aides them in this scheme and hides the truth from the majority of Americans who simply are clueless to what is going on. It is no coincidence that Rep. Wilson called Trump and almost everyone else in the White House racists. She is part of the larger conspiracy, just another actor in this political assassination squad of the left. On a related note; the Democrats/radical left also uses economic disaster to gain power. They cannot let this Trump economic boom continue into the 2018 election. Look back at the economic disaster that surfaced just before the 2008 election; Chuck Schumer and others on the left spent a lot of time trying to crash the economy. Look for a repeat in 2018. I was reminded recently that we never see the actual statement of what these protests are about, originally. It’s good to review. But remember, these protests have nothing to do with veterans who fought for this racist country or police who are apparently wholesale murderers. I’m going to kneel at the game to protest that there are no black placekickers in the NFL. Must be racism unless you suppose that blacks are genetically incapable of kicking a ball through the uprights. And it’s the position where you are least likely to be hurt. A grand example of white privilege. I appreciate the views expressed in this article. I remember reading Instant Replay by Jerry Kramer and was hooked. Of course those men, coaches and players were red-blooded Americans. Those days are gone for those Americans have been replaced by the anti-Americans who foolishly believe they can piss on the flag of The United States of America, on the men and women of the US Armed Forces, and on “we the people.” Kaepernick and the fools who have followed him are not to be forgiven in my book. These “protests” are in truth manipulative lies intended to hurt the United States. I will never support the NFL again, ever. It is not difficult to recognize the enemy these days and I can say without any reservation, these fools are our enemies. This is part of the Gramscian long march through the institutions. The colleges and media are long lost. Political correctness is the order of the day in your workplace. Even birthday cakes and bathrooms are politicized. Now, the NFL, for Pete’s sake. The Left wants to hijack everything to carry its doctrine, like we are freaking North Korea. And everyone is sick to death of it, even the sane liberals. It’s coming apart, which is one reason why the Left is so particularly outraged at events.